I live with my husband, my almost-two-year-old son, and two cats. I grew up in Iowa and moved here after I finished college. My day job is managing a team of software testers. I knit, I sew garments and I have been taking letterpress classes at the MN Center for Book Arts. I also started running - I'll be running a 10 mile race at the end of the month. My grandma taught me how to piece quilts when I was little - she would take me to her church's sewing circle occasionally and I would help piece, stretch and tie patchwork quilts. I had only made patchwork quilts until my last years of college, when some friends convinced me to join a Block of the Month club at a local quilt store. I've made 5 quilts as wedding gifts, one queen size quilt commissioned by a friend, 8 baby quilts, and some lap blankets... probably around 20 quilts. I have at least 4 UFOs, one of which is the Block of the Month club quilt that I started 10 years ago and only needs to be bound. Some weeks 0, some weeks 5 or 10. It depends on whether I have a deadline (like a baby shower or wedding) I'm working towards, and what else I've got going on. The very first quilt I made, with the help of my Grandma and Aunt, is a denim patchwork throw that I think we made the summer before I left for college. 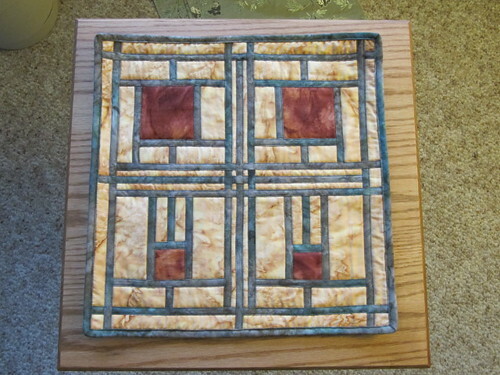 I'm most proud of a series of placemats / tablerunners that I made for my parents living room coffee and end tables. 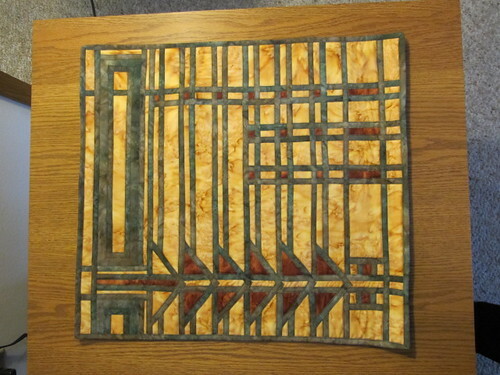 They're based on Frank Lloyd Wright stained glass windows. The tops are one solid piece of fabric, with bias tape and other fabrics machine-appliqued on top. 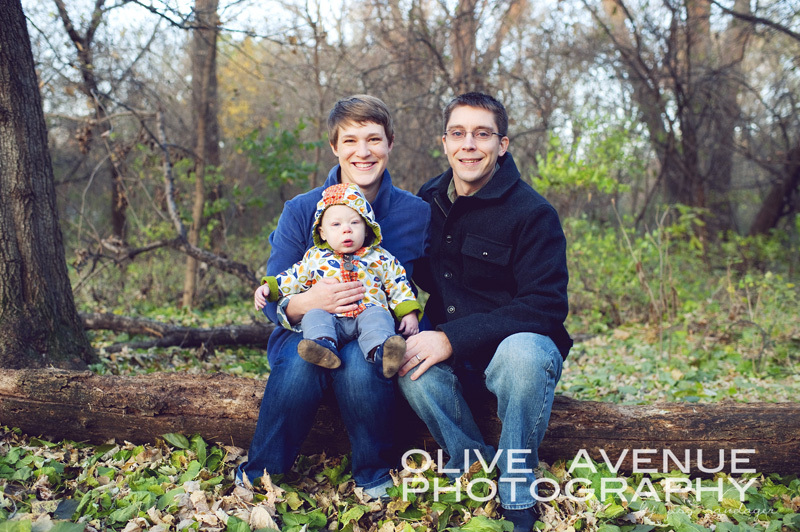 They took a ton of time and were a big challenge, but I love how they turned out. Where do you sew? Describe your space and your favorite quilting accompaniments. My sewing machine is set up in a corner of our basement. I usually watch TV episodes via Hulu or Netflix while I sew. I try to only buy fabrics when I'm working on a project. Still, I've managed to accumulate a lot of fabric and I have a rather large stash that is spilling out of its bins, boxes and shelves and slowly taking over our basement. It's difficult for me to find time and space to baste quilts. It usually takes longer than my son's nap time, and our house doesn't have a lot of floor space. My current goal is to finish a quilt for my son's toddler bed before he grows out of it. My long-term goal is to finish up lingering projects and make a few quilts with fabric that I've had in my stash for years. I'm intimidated by free-motion quilting. I would like to learn, but I haven't had the time to practice enough to get good at it. 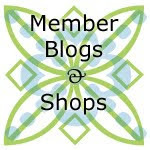 Seeing what other people make at the Guild meetings and on blogs. Get a sewing machine that you like, and learn to use it well. Take classes!